On and off the court, Tarin Keith LoCascio is a true lifetime learner. While she got a late start playing volleyball, her hard work and competitive drive earned her a spot on the NVL’s pro tour. Now, Keith is a staple of the NVL’s tour both on and off the sand. 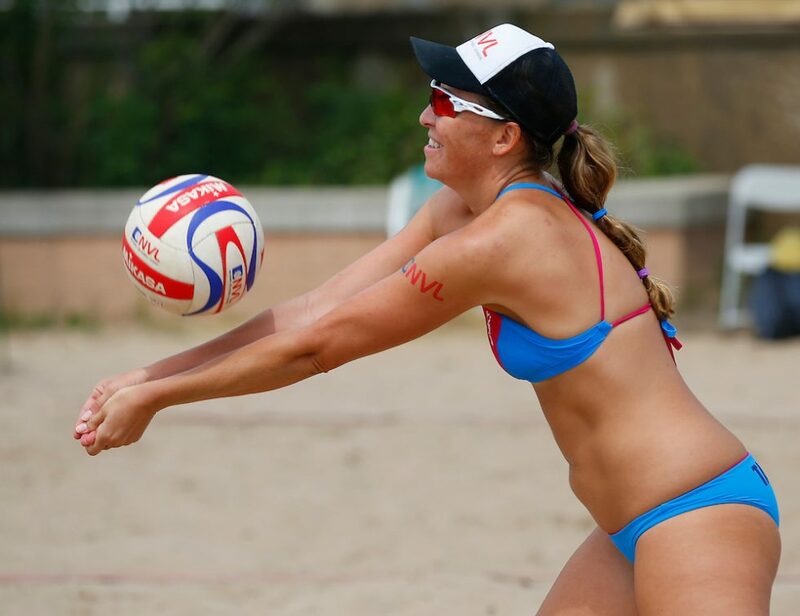 We caught up with her just before the final leg of the 2016 pro tour in Port Saint Lucie to talk about her experience working behind the scenes at the NVL and how she balances a full-time career with her favorite sport. What is the biggest change you’ve seen in the sport since you started playing? Beach volleyball is now part of the NCAA, so we’re at a sort of turning point as a whole as far as the growth of the sport. It’s going to take some time for the professional side of the sport to catch up, so it can support new talent and offer a professional tour where people can make a living. We’re so close, it’s just a matter of how quickly we can get there. Speaking of making a living, off the sand you’re busy running a web development company. 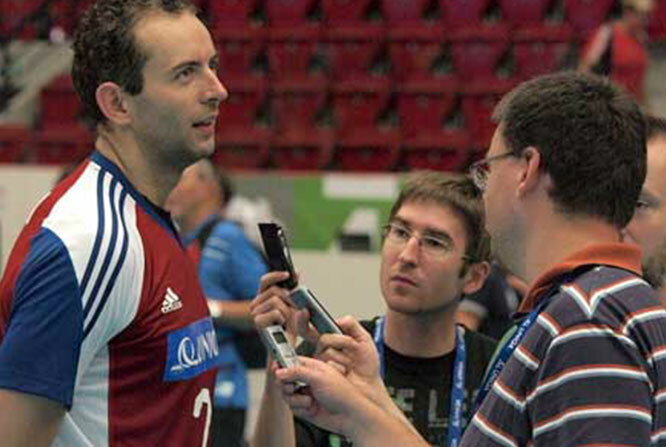 What is your best advice for someone looking to balance volleyball with a full-time career? It’s tricky. It took me a long time to figure out what I wanted to do. It’s hard when you first come out of college, especially if you’ve been playing volleyball your whole life and don’t have any work experience. So you take an entry level job, you put in your time and you work 40 hours a week. You have to come to terms with the fact that sometimes, you’re going to have to get up at 5AM and train before work. That was my life when I graduated college. I had to make volleyball work around my schedule. It really comes down to dedication and discipline. You have to really want it. If you really want to be successful at volleyball and successful in your professional career, you have to put in the time both on and off the court. You’re never just going to be handed a position where you work from home and have a flexible schedule. You have to earn it. I worked really hard when I was younger to make sure that I earned more flexibility in my professional life so I could dedicate my time to training. Of course, balancing a flexible schedule is another challenge, because you don’t just get to leave work at 6PM and sign off for the day. You’re on call 24/7. Sometimes I’m up at 6AM on conference calls or working with our programmers until midnight, but I also get to travel and play volleyball and train in the middle of the day. It really all comes down to discipline. You have to put together a plan and stick to it. Do you have any personal or professional role models? Right now, my volleyball “crush” role model is Laura Ludwig, the German gold medalist. I saw her play a couple of years ago on the FIVB tour and thought she was pretty good, and then I saw her play again this year and thought she was just absolutely amazing. I love watching her style of play. She’s feisty and fired up, and she just makes it look so easy. She has that energy about her that makes you want to root for her. Watching her play is fun, it’s enthralling. As far as business, I had a mentor in college through my first internship. She was a great leader and a great manager of people. People seemed to always respond to her really well. I always kept that in the back of my mind. I want people to respect me but not fear me. I think she saw something in me, so she really helped me grow. My dad has always been my biggest role model. He’s a general manager of casinos in Vegas, which is a huge responsibility. I would sit in on meetings with CEOs and CFOs with him when I was younger and just listen and pay attention. I love that I can still go to him now when I’m struggling with business and we can talk it through and problem solve together. Andy, my husband, is an all-in-one for me, my swiss army knife. I go to him for business, personal, volleyball, and he’s always been my biggest fan since we met. Not only do you tour with the NVL as a player, but you’ve also been working behind the scenes, managing the league’s digital presence, including the website, social media, SEO and live online webcast. With this unique perspective, what do you think sets the NVL apart from other leagues? Do you prefer being on the sand or behind the scenes? The NVL genuinely cares about our players’ success. Unlike other leagues, this league offers players a platform where they can market themselves. That was something I felt was always missing from other leagues. When I first started, I felt like I had something more to offer and I could make a real difference. The NVL allowed me the opportunity to try new things, like broadcasting with our live webcast. Opportunities like this are a great marketing tool for players to get their name in front of sponsors. The NVL makes players feel appreciated, they make us feel like we matter. We call it the NVL family for a reason. As far as participating behind the scenes and on the sand, it’s really all about balance, so when I’m playing, I have to be careful about staying focused before my matches. I can’t let myself be worn out trying to do too much. Preparation is key and I always have to be aware of how much I’m taking on and where I am mentally. The great part about working behind the scenes here is that we have a great team. We all work really well together. I love being on the sand. It’s provided me so many great experiences and opportunities. I’m just so thankful that I not only get to play with the league, but I also get to work with them. I want us to be successful, and it’s great to be able to merge two passions together. What is your biggest motivator to train and travel for the sport? My biggest motivator is the actual competition. I love to compete and it really is an outlet for me as an athlete. I know that someday being an athlete will be a smaller part of my life, but I will always be an athlete. I want to be able to enjoy that for as long as my heart and my mind are in it. If your heart isn’t truly in it, then it’s time to start considering hanging up your suit. For the time being, I still love traveling and competing. It’s hard to lose sometimes, but the great matches that we have and the friendships that we make here are really what keep me going. You’re heading into the final leg of the tour with a new partner, longtime friend Jenn Snyder. How have the two of you prepared as a team and what do you expect going into the tournament together? I had asked Jenn to play with me at the beginning of the season and she had already committed to Chara Harris, and they were a good team together. I’ve always wanted to play with Jenn because I feel like we just have such great chemistry together and our style of play matches up well. I’m looking forward to getting on the court together and seeing if we can make some magic happen. We’ve been friends for a long time and have done the Volleyball Vacations Turks and Caicos trip together about 10 times. We’ve definitely had a lot of fun times together and I think that will help us a lot on the court because we can make each other laugh and we communicate well.